LONDON (Reuters) - European shares eased from 12-week highs on Thursday as weak earnings from Publicis, GEA and TUI offset gains in banks following better-than-expected results from Italy's Unicredit. 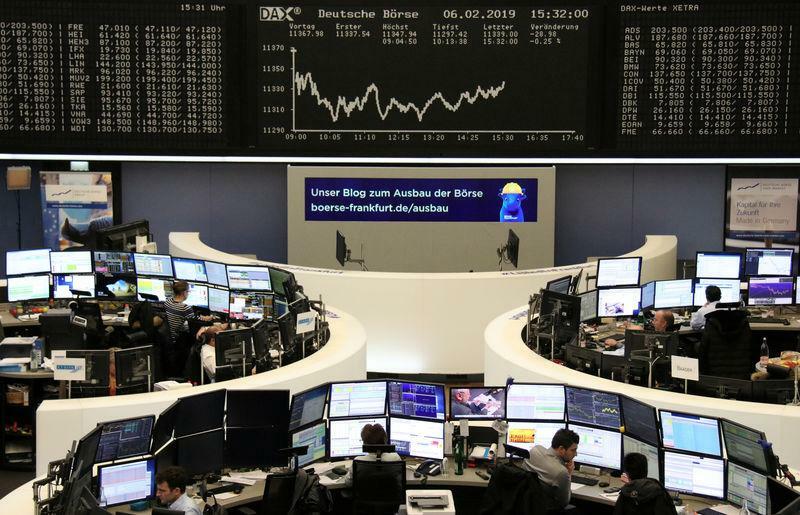 Europe's STOXX 600 was down 0.2 percent at 0935 GMT, with Germany's DAX 0.5 percent lower after disappointing December industrial output numbers for Europe's largest economy reinforced worries about the cooling global outlook. Bank stocks were some of the few gainers in early deals as Italy's biggest bank UniCredit reported consensus-beating fourth-quarter results, bringing some much-needed cheer to the battered euro-zone sector. The stock had risen at the open after investors had initially brushed off the poor outlook and drawn some comfort from the French bank's earnings presentation, which allayed worries about the need for a capital injection, traders said. Publicis dropped 14 percent, set for its biggest one-day fall since 1992 as investors punished the world's No. 3 advertising company for weaker-than-expected revenues. It dragged WPP down with it. "The scale of the miss in 4Q took us by surprise, with attrition among existing accounts negating new business gains," Deutsche Bank analysts said. "What’s more, it appears that the trend is due to continue into 1Q 2019." Tour operator TUI poured more cold water on the travel sector, the latest to blame last summer's hot weather and the weaker pound for weaker-than-expected profits. The London-listed shares sank 15 percent to the bottom of the FTSE 100, hitting their lowest since April 2017. The German-listed shares were set for their biggest fall in almost a decade. Small-cap UK rival Thomas Cook rallied more than 11 percent as investors cheered the company's plan for a strategic review, including a possible sale of its airline business, as the world's oldest travel company seeks to cut debt and restore investor confidence after two profit warnings late last year.